Today was Day #7 of Chocolate and Gluten-Free Cookie Theme Week. 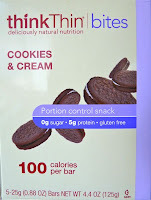 This thinkThin Cookies and Cream "portion control" snack (100 calorie bar) is, loosely speaking, a gluten-free cookie. 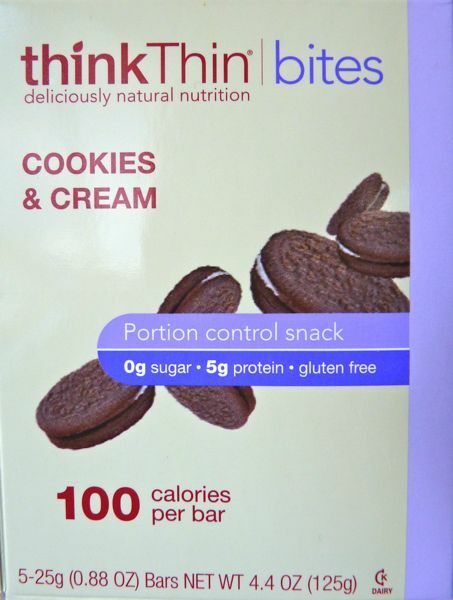 The picture of the cookies on the box is reminiscent of small Oreo brand chocolate sandwich cookies. The gluten-free bar inside the wrapper is covered with a white chocolate-like coating, and the filling is chocolatey-dark -- more similar to an inside out chocolate sandwich cookie. The maltitol may help hold sugar and calories down, but the taste takes some getting used to. I think I'd prefer just a little less sweetener overall.